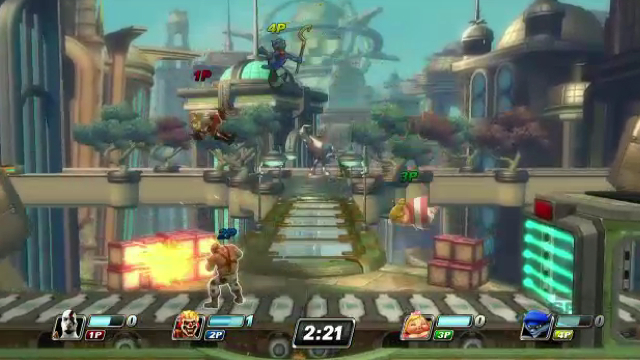 PlayStation All-Stars Battle Royale PS Vita Review. All in all, PlayStation All-Stars Battle Royale successfully mimics the popular Super Smash Bros series and features some sturdy gameplay that unfortunately is hampered by the screen size of the Vita. Impulse Gamer recently reviewed PlayStation All-Stars Battle Royale on the PS3 which received a 8.5/10 and was basically Sony's answer to Nintendo's Super Smash Bros. Even with the weird and diverse roster, this fighter/brawler worked considerably well on the PS3. If you purchased the PS3 version of PlayStation All-Stars Battle Royale, the game also came with the Vita version which was to support the cross-platform compatibility of two consoles. Kind of cool! 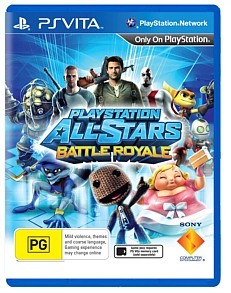 PlayStation All-Stars Battle Royale features a stellar Sony inspired all-star cast that include legendary gaming characters such as Kratos (God of War), Nathan Drake (Uncharted), Jak (Jak & Daxter) and even PaRappa the Rapper (PaRappa the Rapper) plus our favourite Sackboy (Little Big Planet). This is just the surface of the colourful playable characters in this fighter/brawler and at times, it is quite amusing seeing someone like Sackboy fighting a variety of Sony characters like Kratos or Drake. There are even some characters from other franchises such as The Devil May Cry and inFamous that adds to the replay value. As mentioned, the game is heavily inspired by Super Smash Bros which basically throws the player into a one screen environment taken from the environments of all the aforementioned characters as you duke it out with 2+ characters or online players. 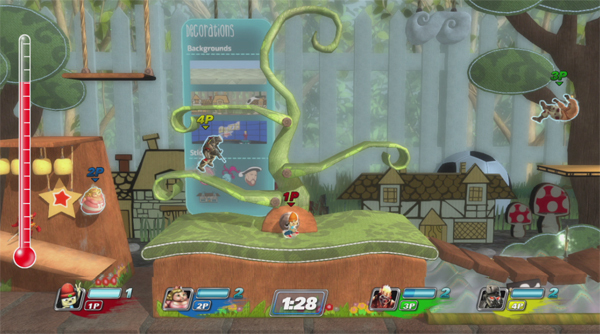 Just like Super Smash Bros, the battle can become quite hectic and messy, especially with the various special attacks of each characters. Controls are quite intuitive and simplistic on the Vita which borders on a button smasher but by linking combos, you can create some powerful tactics. 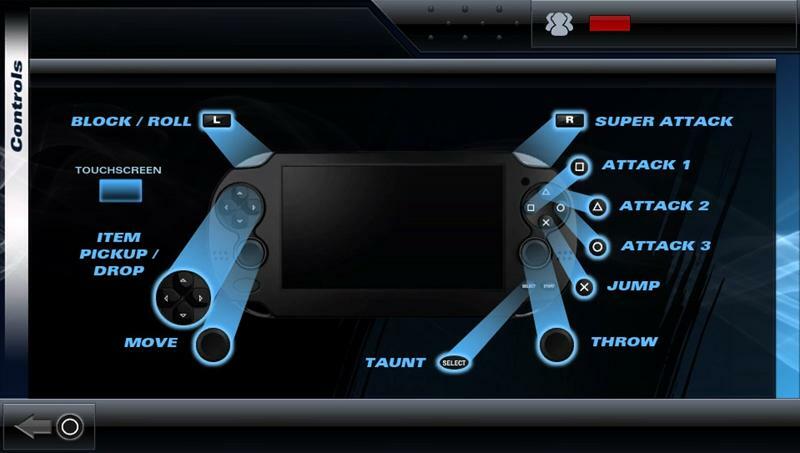 The Buttons are well mapped on the Vita with the face buttons used to attack and jump, with shoulder buttons (left) for blocking and (right), engage in a finishing manoeuvre. The idea of the game is to pummel the absolute living daylights out of your opponents in order to build up your power metre to deliver a super attack. This can be done up to three levels and if you manage to do this before the timer runs out, you are almost guaranteed victory, provided you have the most "kills" acquired. 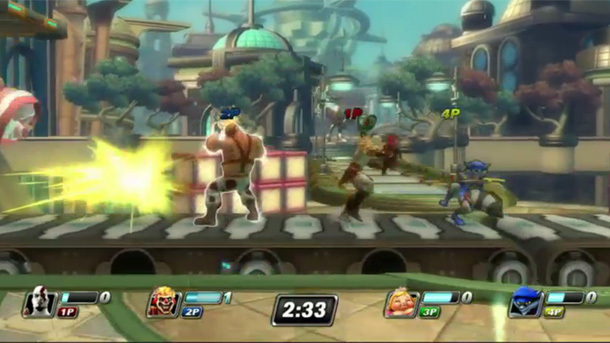 The solo campaign of PlayStation All-Stars Battle Royale is a little lacklustre and more enjoyment of this game can be found in multiplayer, both local and single-player which ups the challenge factor of this game. There's also plenty of unlockable content in the game and Sony have reported that additional DLC characters will be available. The big question is, how does PlayStation All-Stars Battle Royale fair on the Vita? In terms of gameplay and graphics, it works quite well on the Vita but when multiple combatants are fighting each other on the small screen of this console, things become quite tiny which unfortunately compromises the gameplay. On the other hand, when you're playing against one character or another player, PlayStation All-Stars Battle Royale works well on the Vita, however the more characters you fight, almost make the game feel like you are watching Fight Club at a colony of ants. With that said, it is a fun game to play on the Vita, however the PS3 version is far superior, especially when playing it on big screen TV. Graphically the game looks good on the Vita which resembles the PS3 version well and there are some great interpretations of all the characters in the game. Add in some decent special effects and the characters almost jump out of the screen at you. Audio is equally as good and sounds phenomenal through a decent headphone. Unfortunately the large gaming zones make it a tad too hard to see on the Vita screen but even with this limitation, the game still works. All in all, PlayStation All-Stars Battle Royale successfully mimics the popular Super Smash Bros series and features some sturdy gameplay that unfortunately is hampered by the screen size of the Vita. Multiplayer is the highlight of the game due to the unpredictability of human controlled characters and the single-player campaign is unfortunately lacking that X-factor. With the PS3 version being far superior, the Vita version is only for those who do not own their home console brother as on the Vita it's fun but not great due to the frustration factor.